The show was created by Jeffrey Baldinger and Omid Singh one night at 4 A.M. at a Norm's Diner in West Hollywood, California. Omid was telling Jeffrey a Story, and Jeffrey said, "I'll see that story, and I'll raise you this one:" And then he pushed some hash browns on to Omid's plate and exclaimed, "I don't know how Poker works!" Thus Story Poker™ was Born! Created by Jeffrey Baldinger and Omid Singh. We have recorded upwards of 20 episodes of the podcast featuring the likes of Kyle Kinane, Yakov Smirnoff, Erik Griffin, Mary Lynn Rajskub, Ryan Sickler and many more! 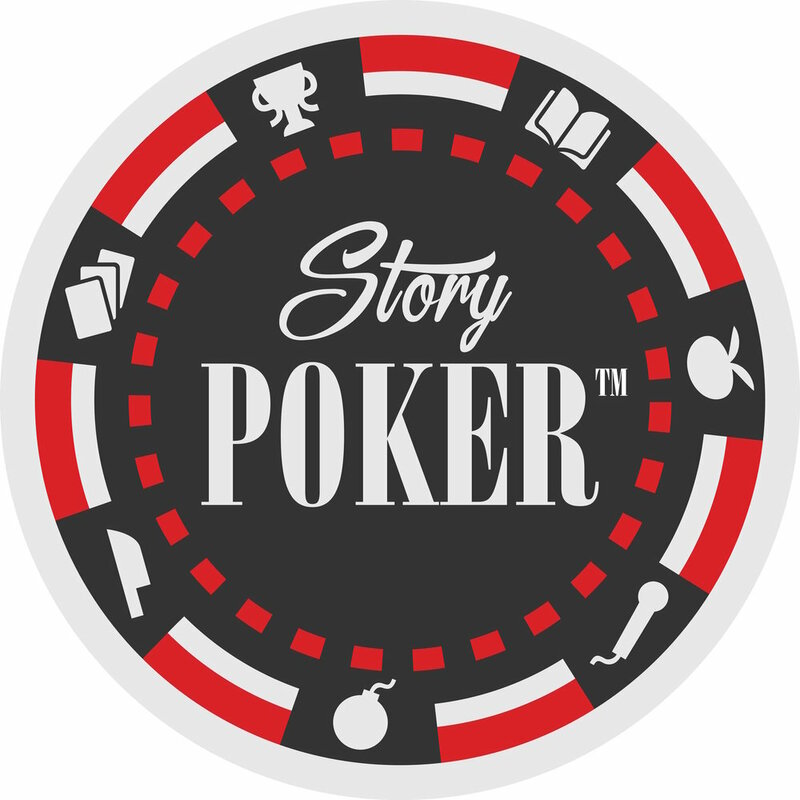 Story Poker™ is about putting the best story tellers around a table and seeing who can think of great stories on the fly. 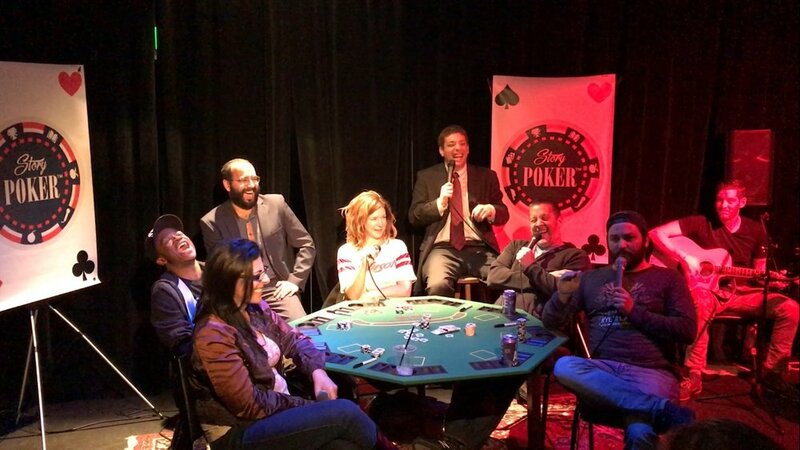 Story Poker™ is a gameshow where comedians gather around an audience and compete for story telling glory. Players come prepared with 3 stories ready-to-go but if they don't play their Ante's right, they might not tell any of those stories and they will have to think of something new. What does the new story have to be about? The new story you tell will have to be related to any themes from the previous stories told by the other players. So I tell this story: After high school I moved from Irvine, CA to Bed-Stuy, NY and lived in a hostel for a whole year pretending to be a UCLA student. I was pretending to be a UCLA student because the hostel gave student discounts. I ended up dating the manager of the hostel so I went from living in a 10 bed-room to a private room with infinite blowjobs. One day, a Slovenian alpha male checked into hostel and the next thing I knew he was getting the infinite blowjobs I was growing accustomed to. Soon after that, I moved back in with my mom in Weston, CT.
What does that story make you think of? If you were the next story teller you would tell a 3-6 minute story that is somehow related to any of the themes from my story (Hostels, Students, Blowjobs, Slovenia, Irvine, Bed-Stuy...) and you want it to be better than my story. Story Poker™ - The Live Shows! We have had 5 Live Shows at the Lyric Hyperion Theatre in SilverLake, Los Angeles, CA. Make sure to check back regularly for dates and guests! Past guests have included: Becky Robinson, Sandro Iocolano, Ed Greer, Jeremiah Watkins, Ryan Sickler, Billy Bonnell, Emily Maya Mills, Kira Soltanovich, Earl Skakel, Matt McCarthy, Joe Dosch, Chase Bernstein, Leah Kayajanian, Helen Hong, Mary Lynn Rajskub, Mike Lawrence, & many more! Another perk of the live shows is you get to hear the Live Music from the show from Danny Fitch!